^ a b c Unbylined (n.d.). "Criss Angel biography". Las Vegas Sun. Archived from the original on November 20, 2009. Retrieved November 20, 2009. ^ "Criss Angel to close 'Believe' to launch 'Mindfreak Live!' at Luxor". March 17, 2016. ^ "Criss Angel is named Magician of the Decade; Mindfreak starts up in May". LasVegasWeekly.com. Retrieved June 15, 2018. ^ "Luxor headliner Criss Angel is named Magician of the Century". LasVegasSun.com. April 28, 2010. Retrieved June 15, 2018. ^ a b c d e f g h "Criss Angel Biography". Biography. Retrieved February 12, 2014. ^ Kopka, Deborah (November 25, 2010). Eastern Europe and Russia: Eastern Europe and Russia. Lorenz Educational Press. p. 49. ISBN 978-1-4291-2252-8. Retrieved April 6, 2012. ^ Lovece, Frank (October 15, 2013). "Criss Angel on his new show, 'BeLIEve': 'It's healthy' to be skeptical". Newsday. New York City / Long Island. Retrieved October 29, 2013. ^ a b c d e f g h "Criss Angel Bio". Las Vegas Sun. Retrieved February 12, 2014. ^ Marc Morrone; Nancy Ellis-Bell (2010). A Man for All Species: The Remarkable Adventures of an Animal Lover and Expert Pet Keeper. Random House. p. 97. Retrieved February 13, 2014. ^ Karen Idelson (September 15, 2006). "Now you see them: magic goes mainstream as bigscreen pics, cable hits and Vegas hipsters offer more than card tricks". Daily Variety. Archived from the original on March 29, 2015. Retrieved February 13, 2014. ^ a b Robin Leach (November 19, 2013). "A war of wizards: Criss Angel and David Blaine duel with rival TV shows". Las Vegas Sun. Retrieved February 12, 2014. ^ a b "Criss Angel Biography". IMDB. Retrieved February 13, 2014. ^ a b c "Season Three: He Can Escape, Levitate, Walk on Water, Hang from a Helicopter and Perform Other Seemingly Impossible Tricks and Death-Defying Stunts. Meet Criss Angel (below), Magician, Illusionist and Showman Extraordinaire, Who Is about to Shift Your Mind and Mesmerise Your Senses with His Amazing Mental Powers". Sunday Tribune. August 12, 2012. Archived from the original on March 29, 2015. Retrieved February 13, 2014. ^ Frank Lovece (October 11, 2013). "Criss Angel on his new show, 'BeLIEve': 'It's healthy' to be skeptical". Newday. Retrieved March 7, 2014. ^ Sarah Kugler (August 26, 2002). "Illusionist, trained in backyard pool, tries 24 hours underwater in Times Square tank". Associated Press. Archived from the original on March 29, 2015. Retrieved February 12, 2014. ^ Ted Shaffrey (August 27, 2002). "Illusionist emerges after 24 hours underwater, thanks crowd, plugs show, passes out". Associated Press. Archived from the original on March 29, 2015. Retrieved February 12, 2014. ^ Jim Forkan (September 30, 2002). "'Halloween' promo estimate: $2.5m. (ABC Family)". Multichannel News. Archived from the original on March 29, 2015. Retrieved February 13, 2014. ^ "Television highlights for the week of Oct. 20-26". Knight Ridder. October 10, 2002. Archived from the original on March 29, 2015. Retrieved February 13, 2014. ^ "TV: Tune in to the alternative magical experience.(Features)". Birmingham Evening Mail. December 20, 2002. Archived from the original on March 29, 2015. Retrieved February 13, 2014. ^ "Illusionist Criss Angel calls out Blaine for duel". Knight Ridder. October 30, 2003. Archived from the original on March 29, 2015. Retrieved February 12, 2014. ^ Linda Stasi (October 30, 2003). "Magic's Fallen Angel". New York Post. Retrieved March 7, 2014. ^ "Cirque du Soleil Criss Angel". Retrieved February 13, 2014. ^ "Brewers adept at reaching the consumer". Drug Chain Review. March 3, 2003. Archived from the original on March 29, 2015. Retrieved February 13, 2014. ^ Glenn Pere (August 22, 2005). "Hint to broadcast networks: bold is beautiful". Broadcasting & Cable. Archived from the original on March 29, 2015. Retrieved February 13, 2014. ^ Peter Carlson (June 21, 2005). "Hey, Grads! To Get Ahead, Get With the Forbes Program". Washington Post. Archived from the original on March 29, 2015. Retrieved February 13, 2013. ^ "A&E's show slate: more reality fare". Multichannel News. January 17, 2005. Archived from the original on September 24, 2015. Retrieved February 13, 2014. ^ MGM Mirage (2009). "Property Highlights - Stairway To The Stars". MGM Mirage. Retrieved January 9, 2009. ^ Greg Hernandez (August 24, 2005). "REALITY ROCKS ON DVD KNOWING HOW TV SHOWS TURNED OUT IS PROVING TO BE NO TURNOFF FOR FANS OF THE GENRE". Los Angeles Daily News. Archived from the original on March 29, 2015. Retrieved February 13, 2014. ^ R.D. Heldenfels (August 25, 2006). "'Arrested Development' season 3 freed for purchase". Akron Beacon Journal. Archived from the original on March 29, 2015. Retrieved February 13, 2014. ^ Doug Elfman (May 31, 2006). "What Else: Is On". Chicago Sun-Times. Archived from the original on March 29, 2015. Retrieved February 13, 2014. ^ Jay Cronley (August 15, 2006). "Tulsa World, Okla., Jay Cronley column: Ratings in: TV's worst, the best". Tulsa World. Archived from the original on March 29, 2015. Retrieved February 13, 2014. ^ Denise Martin (July 14, 2006). "Krause finds new worlds in 'Room'". Daily Variety. Archived from the original on March 29, 2015. Retrieved February 13, 2013. ^ "Magician Criss Angel in New Cirque Show". Associated Press. March 23, 2007. Archived from the original on March 29, 2015. Retrieved February 12, 2014. ^ David Bauder (May 25, 2007). "Criss Angel dreams up a new stunt". The Record. Archived from the original on March 29, 2015. Retrieved February 12, 2014. ^ Cheryl Binning (September 15, 2007). "Use Your Illusion". Winnipeg Free Press. Archived from the original on March 29, 2015. Retrieved February 13, 2014. ^ Ling-Sze Gan (April 1, 2010). "Super market sweep: come April 12–16, some 11,500 media professionals from 102 countries, including 4,000 buyers, will coverge at MIPTV in Cannes. Television Asia Plus' Christine Wong looks at some of the fare on offer this market". Television Asia. Archived from the original on March 29, 2015. Retrieved February 13, 2014. ^ Levi J. Long (April 19, 2007). "Freaks at the fair". Arizona Daily Star. Archived from the original on September 24, 2015. Retrieved February 13, 2014. ^ a b Laura Fries (July 12, 2005). "Criss Angel Mindfreak. (Television Program Review)". Daily Variety. Archived from the original on September 24, 2015. Retrieved February 12, 2014. ^ a b "Criss Angel Platinum Magic kit and Criss Angel collection". Mass Market Retailers'. Archived from the original on September 24, 2015. Retrieved February 13, 2014. ^ "Tricky Treat". Sunday Tribune. February 17, 2013. Archived from the original on September 24, 2015. Retrieved February 13, 2014. ^ "The Political Wizard; A Long Way from Kansas: Judy Garland (Centre) Starred in the Film Version". Daily Mail. September 2, 2008. Retrieved February 13, 2014. ^ Bobby Kittredge (2013). Amusings: The Modern Essay. Trafford Publishing. p. 163. Retrieved February 13, 2014. ^ Mike Donila; Jackie Alexander (July 30, 2008). "Criss Angel escapes an imploding hotel — but not as expected". Tampa Bay Times. Archived from the original on March 7, 2014. Retrieved March 7, 2014. ^ a b Robin Leach (January 29, 2013). "Criss Angel to go global on new TV series as 'Believe' marks five years". Las Vegas Sun. Retrieved February 13, 2014. 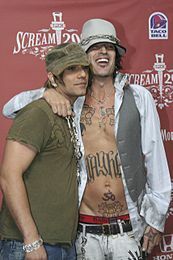 ^ "Criss Angel and Cirque du Soleil name new Las Vegas show after Harry Houdini legend". Associated Press. April 17, 2008. Archived from the original on March 29, 2015. Retrieved February 12, 2014. ^ Lee, Chris (October 12, 2008). "Criss Angel believes that you will too". Los Angeles Times. Retrieved November 4, 2008. ^ Abowitz, Richard (June 30, 2008). "Cirque and Angel's 'Believe' delayed". Los Angeles Times. Archived from the original on July 4, 2008. Retrieved November 4, 2008. ^ Abowitz, Richard (September 2, 2008). "Previews of Criss Angel's 'Believe' delayed again". Los Angeles Times. Archived from the original on October 21, 2008. Retrieved November 4, 2008. ^ Abowitz, Richard (September 13, 2008). "Breaking news: More delays for Angel's 'Believe'". Los Angeles Times. Archived from the original on October 23, 2008. Retrieved November 4, 2008. ^ Abowitz, Richard (September 29, 2008). "Sneak peak [sic] at Criss Angel's 'Believe'". Los Angeles Times. Archived from the original on November 6, 2008. Retrieved November 4, 2008. ^ Elfman, Doug (September 28, 2008). "Angel's 'Believe' magic: Miffed fans disappear". Las Vegas Review-Journal. Retrieved November 4, 2008. ^ Abowitz, Richard (October 31, 2008). "Criss Angel's 'Believe' hard to believe". Los Angeles Times. Archived from the original on November 3, 2008. Retrieved November 4, 2008. ^ Brown, Joe (November 1, 2008). "Illusion is elusive in Angel's 'Believe'". Las Vegas Sun. Retrieved November 4, 2008. ^ Elfman, Doug (November 3, 2008). "New Criss Angel show is unbelievably bad, sad". Las Vegas Review-Journal. Retrieved November 4, 2008. ^ Johnson, Reed (November 3, 2008). "Criss Angel, in a word: unbelievable". Los Angeles Times. Retrieved November 4, 2008. ^ a b c Robin Leach (October 2, 2013). "Q+A: Criss Angel's new Spike TV series 'Believe' includes raising-the-dead episode". Las Vegas Sun. Retrieved February 12, 2014. ^ Clarke, Norm (April 19, 2009). "Coarse shout-out stirs up Tweeters". Las Vegas Review-Journal. Retrieved September 26, 2010. ^ Abowitz, Richard (April 20, 2009). "Perez Hilton's excellent Vegas adventure, from Criss Angel to Miss USA". Los Angeles Times. Archived from the original on April 23, 2009. Retrieved September 26, 2010. ^ Abowitz, Richard (April 20, 2009). "Perez Hiton gets apology from Cirque; Angel remains silent". Los Angeles Times. Archived from the original on April 23, 2009. Retrieved September 26, 2010. ^ Katsilometes, John (January 2, 2011). "'Believe' it: Criss Angel's work has markedly improved Luxor show". Las Vegas Sun. Retrieved December 12, 2012. ^ Ouzounian, Richard (January 5, 2011). "Sin City offers plenty of theatrical second chances". Toronto Star. ^ Tony Dokoupil (March 13, 2011). "Can Celine Dion Save Las Vegas?". Newsweek. Retrieved March 7, 2014. ^ a b c d Robin Leach (December 11, 2013). "Criss Angel reveals new Luxor show to run during rehab for shoulder surgery". Las Vegas Sun. Retrieved February 12, 2014. ^ Greg Szalai (November 7, 2013). "Endemol Takes International Rights to Spike TV's 'Criss Angel Believe'". The Hollywood Reporter. Retrieved February 13, 2014. ^ Robin Leach (November 26, 2013). "Criss Angel gets all choked up for his Spike TV series 'Believe'". Las Vegas Sun. Retrieved February 12, 2014. ^ Gwynedd Stuart (November 13, 2013). "Criss Angel ruins the illusion on Believe". Chicago Reader. Retrieved March 3, 2014. ^ Brittany Frederick (November 20, 2013). "5 Things We Learned From 'Criss Angel BeLIEve': 'Lord of Illusions'". Star Pulse. Retrieved March 3, 2014. ^ "Larry King Live: Mindfreak Criss Angel". CNN. October 30, 2007. Archived from the original on March 6, 2010. Retrieved July 7, 2007. ^ "Angel sparks altercation on 'Phenomenon'". MSNBC. November 1, 2007. Retrieved November 7, 2007. ^ Robin Leach (January 28, 2014). "Criss Angel reveals secrets and surprises of 'Magic Jam' debuting next week at Luxor". Las Vegas Sun. Retrieved February 13, 2014. ^ Robin Leach (February 14, 2014). "Q+A: Despite surgery and rehab, Criss Angel presents 'Magic Jam,' reveals 'Believe' illusion". Las Vegas Sun. Retrieved February 24, 2014. ^ "Review: Criss Angel masterful at The Paramount in New York (Includes first-hand account)". Retrieved February 27, 2016. ^ "Criss Angel Expands His Live Brand With 'Mindfreak Live' And 'The Supernaturalists'". Starpulse. Retrieved February 27, 2016. ^ WMAR Staff. "Magician Criss Angel brings Mindfreak Live! to Baltimore". WMAR. Archived from the original on March 4, 2016. Retrieved February 27, 2016. ^ Robin Leach. "Criss Angel to premiere 'Mindfreak Live' on Nov. 13 in Dubai". LasVegasSun.com. Retrieved February 27, 2016. ^ "Criss Angel Pulls Off Houdini Death Escape at Foxwoods". NBC Connecticut. Retrieved February 27, 2016. ^ "Review: 'The Supernaturalists' is an outstanding new show by Criss Angel (Includes first-hand account)". Retrieved February 27, 2016. ^ Robin Leach. "Criss Angel's 'Supernaturalists' the 'standard bearer for a first-class touring ensemble magic show'". LasVegasSun.com. Retrieved February 27, 2016. ^ Christina Hennessy (June 22, 2015). "Criss Angel brings 'The Supernaturalists' to Foxwoods". Connecticut Post. Retrieved February 27, 2016. ^ "Special guest host Criss Angel details his night on Raw (1:01)". WWE.com. March 8, 2010. Retrieved February 12, 2014. ^ Caldwell, James (March 8, 2010). "Caldwell's WWE Raw Report 3/8: Complete coverage of Cena vs. McMahon, Taker-Michaels confrontation". PWTorch. Retrieved March 10, 2010. ^ Leach, Robin (March 9, 2010). "Criss Angel makes magic at WWE's Raw in Portland". Las Vegas Sun. Retrieved March 10, 2010. ^ Frank Main (September 8, 2009). "Getting ready for Oprah". Chicago Sun-Times. Archived from the original on September 24, 2015. Retrieved February 13, 2014. ^ "Magician Criss Angel Amazes Oprah Video". O Magazine. September 9, 2009. Retrieved February 12, 2014. ^ Janine Driver; Mariska van Aalst (2010). You Say More Than You Think: Use the New Body Language to Get What You Want!, The 7-Day Plan. Random House. p. 152. Retrieved February 13, 2014. ^ a b "Criss Angel profile". TMZ.com. Retrieved February 12, 2014. ^ "Ellen DeGeneres Halloween Special". TV.com. October 31, 2006. Retrieved February 12, 2014. ^ "The Tonight Show with Jay Leno Season 19 Episode 35". TV.com. August 2, 2010. Retrieved February 12, 2014. ^ "Late Show with David Letterman Episode dated 22 May 2006". IMDB. May 22, 2006. Retrieved February 12, 2014. ^ Liz Raftery (June 6, 2012). "America's Got Talent: Goth Opera Singer Andrew De Leon Wows Judges". People (magazine). Archived from the original on March 2, 2014. Retrieved February 12, 2014. ^ "The Rosie Show: Season 1, Episode 16". IMDB. October 31, 2011. Retrieved February 12, 2014. ^ "CSI: NY Season 3 Episode 18". TV.com. February 28, 2007. Retrieved February 12, 2014. ^ "Rules of Engagement: Season 5, Episode 14". IMDB. January 17, 2011. Retrieved February 12, 2014. ^ Nat Ives (June 13, 2011). "Popcorn Bag Becomes a Bowl in May's Most-Recalled New Spot (Criss Angel Not Required)". Ad Age. Retrieved December 12, 2012. ^ Tom Breihan (May 25, 2007). "VH1's Rock Honors: A Running Diary". Village Voice. Archived from the original on December 13, 2014. Retrieved February 12, 2014. ^ Natalie Martinez (September 6, 2007). "Daily Entertainment Break: Sherri Shepherd to join 'The View'". San Jose Mercury News. Archived from the original on March 29, 2015. Retrieved February 13, 2014. ^ BEVERLEY LYONS AND LAURA SUTHERLAND (September 8, 2007). "The Razz: Showbuzz". Daily Record. Retrieved February 13, 2014. ^ "Jacko's Angel clips Copperfield's wings". The Star. May 12, 2009. Archived from the original on March 29, 2015. Retrieved February 13, 2014. ^ Rob Lowman (March 10, 2013). "After 'Office' Leave, Steve Carell Re-Appears as Vegas Magician in 'Burt Wonderstone'". Press-Telegram. Archived from the original on March 29, 2015. Retrieved February 13, 2014. ^ Christy Lemire (March 12, 2013). "Review: Little magic in 'Burt Wonderstone'". Associated Press. Archived from the original on March 29, 2015. Retrieved February 13, 2014. ^ David Edwards (March 15, 2013). "Tricks and Treats". The Mirror. Retrieved February 13, 2014. ^ "Criss Angel profile". Madame Tussauds. Archived from the original on June 12, 2009. Retrieved February 13, 2014. ^ a b Chris Harris (June 2, 2006). "Illusionist Criss Angel Freaks On New LP, Freaks Out Ice Cube With Magic". MTV.com. Retrieved February 12, 2014. ^ "HM - Internet Exclusives". Archived from the original on February 4, 2012. Retrieved February 27, 2016. ^ "Mindfreak book review". California Bookwatch. August 1, 2007. Archived from the original on September 24, 2015. Retrieved February 13, 2014. ^ a b "Orville Redenbacher's Gourmet Popping Corn Introduces New Bag-to- Bowl Design". Manufacturing Close-Up. March 23, 2011. Archived from the original on March 29, 2015. Retrieved February 13, 2014. ^ "Believe". Archived from the original on April 20, 2008. Retrieved February 13, 2014. ^ Robin Leach (November 11, 2013). "Strip Scribbles: Criss Angel's new TV series goes global, puts Las Vegas on world stage". Las Vegas Sun. Retrieved February 13, 2014. ^ Allison Cerra (August 9, 2010). "Ideavillage Products to market, distribute Criss Angel magic kit". Drug Store News. Retrieved February 13, 2014. ^ "Magician David Blaine Nominated for Consideration for First Ever Houdini Award From Scranton's Famous Houdini Museum". Science Letter. October 7, 2008. Archived from the original on March 29, 2015. Retrieved February 13, 2014. ^ Robin Leach (March 7, 2011). "Criss Angel, award winner and new Magic Hall of Fame member". Las Vegas Sun. Retrieved February 24, 2014. ^ "Illusionist Criss Angel Receives Star on Hollywood Walk of Fame". City News Service. July 20, 2017. Retrieved July 21, 2017 – via KNBC. ^ "Most People to Disappear During an Illusion". Guinness World Records. Retrieved February 13, 2014. ^ Gray, Mary (November 1, 2008). "Criss Angel: Holly Madison Is a 'Beautiful' Person". People.com. Retrieved November 10, 2008. ^ "Holly Madison and Criss Angel Kaput", Yahoo News, February 25, 2009. ^ Johnson, James. "Illusionist Criss Angel Proposes To Sandra Gonzalez", Inquisitr.com, September 20, 2011. ^ Michael J Sorba (February 24, 2010). "Big Bear Choppers creating skeleton bike for illusionist Criss Angel". San Bernardino County Sun. Archived from the original on March 29, 2015. ^ "Criss Angel: Giving Back". Magic Place. Archived from the original on October 8, 2011. Retrieved December 12, 2012. ^ Robin Leach (May 22, 2010). "Criss Angel says Make-A-Wish Award beats all others". Las Vegas Sun. Retrieved December 12, 2012. ^ "Criss Angel's Magical $70 Million-a-Year Profit Machine" – via www.bloomberg.com. "Criss Angel: Supernatural". (TV special) SciFi.com. 2003. Archived from the original on February 3, 2004.